“The global economy is facing a ‘triple crunch’. It is a combination of a credit-fuelled financial crisis, accelerating climate change and soaring energy prices underpinned by an encroaching peak in oil production. These three overlapping events threaten to develop into a perfect storm, the like of which has not been seen since the Great Depression. To help prevent this from happening we are proposing a Green New Deal”. The report is the group’s first attempt, and some areas are stronger than others, however, what I think is centrally important about this report is that it puts the global credit crisis alongside peak oil and climate change, or as Colin Hines colourfully put it (with a mental image that I struggle to get out of my mind) “the three shits hitting the fan”. 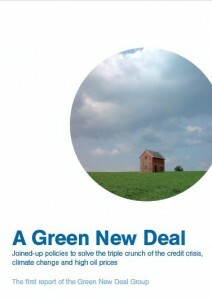 The Green New Deal is modelled on Roosvelt’s New Deal has 2 main strands, a major restructuring and regulation of national and international financial and taxation systems, and also a sustained programme of energy conservation, the installation of renewables and effective demand management. The plan for this is to create the conditions for the emergence of a stable post-oil, resilient, low carbon economy, and the creation of what the report terms a “carbon army” of trained workers to provide the human resources for this vast environmental reconstruction programme. Re-regulating the domestic financial system. Inspired by reforms implemented in the 1930s, this would imply cutting interest rates across the board– including the reduction of the Bank of England’s interest rate – and changes in debt-management policy to enable reductions in interest rates across all government borrowing. This is designed to help those borrowing to build a new energy and transport infrastructure. In parallel, to prevent inflation, we want to see much tighter regulation of the wider financial environment. The report is released today, and you can download the pdf for free here. It would be good to hear your thoughts once you’ve had a look at it… . Others have started writing about it, such as Mark Lynas, Andrew Simms and Caroline Lucas, and it appears on today’s BBC News, as well as in most other papers and news services. Not to be overly skeptical about what sounds like a fine proposal, but manifestos like this always bring to mind the fable about the mice discussing how to bell the cat. “Breaking up the discredited financial institutions”? Sure, great. But who bells the fat cats? The people in power are those who created and profit from the current state of affairs. I particularly enjoyed the perspective the report gives you by bringing in the fascinating parallels of the 1930s and 1940s, the lessons from history chapter. It is inspiring to read how the contraints of the war years drove such social and political innovation: this positive approach is surely the most productive way to confront the enormity of the challenges that are fast coming upon us.